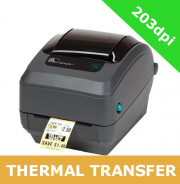 The Zebra GK420d direct thermal printer and the Zebra GK420t thermal transfer printer are the ideal option for applications that require network manageability and low total cost of ownership. The top selling desktop printer in the world, the Zebra GK420d and GK420t provides a proven design and long term dependability and are the top choice for a variety of mid-volume and distributed-printing applications to reliably produce quality text, barcodes or graphics. 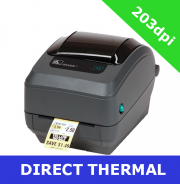 The Zebra GK420d direct thermal desktop printer and Zebra GK420t thermal transfer desktop printers offer a basic, affordable option for companies who want to start automating. The Zebra GK420 series is available in 203dpi resolution and has a maximum print width of 104mm. The Zebra GK420d and GK420t printers have serial, parallel and USB 1.1 interfaces as standard - ZebraNet 10/100 PrintServer network connectivity is available as an option (replaces serial and parallel ports) and both the ZPL and EPL programming languages come as standard. The intuitive design of the Zebra GK420d and GK420t printers combines a choice of three connectivity interfaces and optional 10/100 Ethernet, co-resident EPL2 and ZPL II programming languages and Unicode to ensure quick and efficient integration. The Zebra GK420d offers direct thermal only models for simplicity and cost savings.